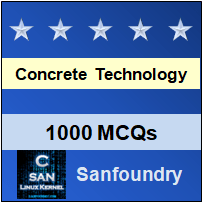 This set of Concrete Technology Multiple Choice Questions & Answers (MCQs) focuses on “Testing”. Explanation: It is the formula to find the gauge length when we have the area of the specimen in universal testing machine. Explanation: The failure occur i.e., he crack appears along the diagonal during the compression test of cast iron. Explanation: The Brinell method applies a predetermined test load (F) to a carbide ball of fixed diameter (D) which is held for a predetermined time period and then removed. Explanation: In charpy test specimen, the angle of v-notch section is 45 degrees and 0.25mm radius along the base.